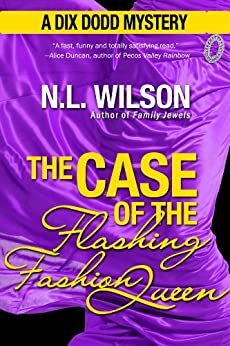 NORAH WILSON is a Kindle best-selling author of romantic suspense and paranormal romance. HEATHER DOHERTY writes dark literary fiction and not-so-dark children’s lit. Inexplicably, they co-write the hilarious Dix Dodd mystery series. They also write YA and YA paranormal together. Fun Read! I enjoyed this book very much and I am sure that I'm going to read more in this series. This series has provided me with another choice of a lighten up read to unwind with after a serious book by such as Rick Mofina or Don Easton. This story introduces a caste of wacky but likeable and fairly well developed characters lead by Dix and Dylan but by far the most outstanding, and wacky, character is Mrs. Presley! I think this Mrs. P outshines Mary Jane Maffini's Mrs. P (Mrs. Parnell) from the excellent Camilla MacPhee series by a country mile! I couldn't help noticing, or more like feeling, the great resemblance of this book to that Camilla MacPhee series and I don't think that's too bad of a thing! I know there are all sorts of implausible, improbable and probably impossible scenarios and quite likely some plot holes, too, but we read these books for escapism and entertainment and I sure got enough of both from this book particularly the entertainment thing! I'll definitely be reading the rest of this series. I don't think I'm giving anything away here when I say that there is no way any cop would ever have accused the detective of murder when she had an alibi. She was sitting in the car WITH her assistant when the murder took place. But right off the bat, this cop accuses her because he doesn't like her so she gets all worried, hands over all her pictures and notes... and never even mentions the assistant. Meh. It didn't make sense right off the bat, she's a lousy detective and most of the humor wasn't particularly funny to me either. I couldn't even finish it. For the most part I enjoyed this story. It bogged down in some places and I speed read through them. But overall it was a good story line and a surprising ending which is always a bonus. I really enjoyed meeting the characters in this first book of the series. Lots of red herrings and a hint of romance and the surprise (at least to me) ending made me want to read the next book. Funny, light hearted and easy to read. Reminds me of the Janet Evanowich novels with Stephanie Plum. This book will not stretch your mind, but it's a great summer by the pool read. Don't remember receiving this. Will have to look around to see if have. Received today. I liked the story a lot. The characters are great and the plot is well written.